Engineered wood is a wood flooring solution that looks like the real thing but offers a little more stability and flexibility to certain areas of your home. Like solid wood, engineered wood flooring comes in various thicknesses. So how do you decide how thick your flooring should be? Three key points should be considered before making your final selection. 1. Will you be using under floor radiant heating? 2. How much traffic will your floor see? 3. What is your subfloor made from? Many homeowners purposely select engineered wood floors so they can have radiant heating installed underneath. A thinner plank will allow more heating to transfer to your space in a faster way. That said, you should pay attention to manufacturers guidelines to ensure your engineered wood meets specifications for installation. Certain areas of your home are subjected to more traffic than others. Hallways, entryways, kitchens, and living spaces can all have a lot of wear and tear, especially if you have kids and pets. Investing in a thicker board gives you more life in your flooring. If you have the ability to sand it and refinish it multiple times, it’ll keep looking it’s best for years to come. The number of times you can sand engineered floor is determined by the thickness of the wood top layer. Depending on its thickness, it is capable of being sanded a half-dozen times or so. Work with a qualified engineered wood flooring dealer to learn about all of your options. 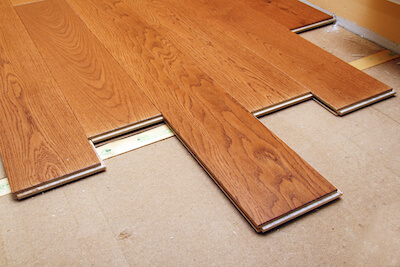 Your subfloor also plays a factor into what type of engineered wood you can lay. If your subfloor is uneven, a thicker board can help you overcome some of the minor issues better than a thin one can. If you’re planning on laying the engineered wood boards directly over the joists, it is essential to go with a thicker board to provide the stability you need.